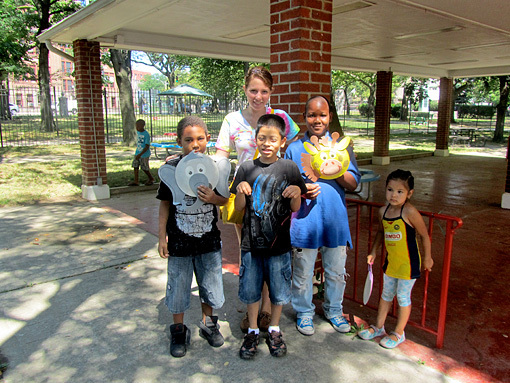 Jessica Palmer '12 during the Summer Fun in the Park program that was part of her Blumenthal internship at Westchester Jewish Community Services. Stefani Negrin '09 remembers the first 5-year-old she worked with when she was a Blumenthal intern during the summer of 2008. "I can still remember wanting to take him home," recalls Negrin, who interned at the Children's Village, a social services agency in Dobbs Ferry, N.Y., serving children of Westchester County and all five boroughs of New York City. "He was just a kid who had never been safe in any place he was," she continues. "It was a very traumatic case. And this was the first place he felt safe, because of the structure, the care. He had the mouth of a 15-year-old, but you could still see the 5-year-old in him." 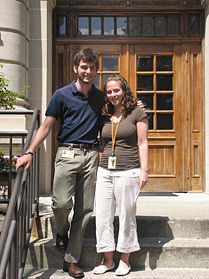 Blumenthal interns Corey Blant, left (a University of Michigan student), and Stefani Negrin '09 in 2008. Negrin interned at the Children's Village, a social services agency in Dobbs Ferry, N.Y.
Children's Village has a 250-acre campus that includes a residential home for troubled boys, a myriad of programs for at-risk children and a short-term care facility for boys and girls in foster care, where Negrin was placed as a caseworker. That facility is one of 11 social service agencies handpicked by Karen Blumenthal '72, who with her husband, Dave Blumenthal '71, has funded paid social justice and human service internships for Cornell students every summer since 2000. The inspiration for the Blumenthals' gift to fund internships came from their daughter's experience in 1999. Jill Blumenthal '01 was able to accept the unpaid internship at Lawyers for Children in Manhattan only because her parents agreed to support her for the summer. "We used to joke that she was on a 'Blumenthal Scholarship,'" recalls Karen Blumenthal. The value of social justice and human service work is what Blumenthal thinks about when she writes the checks each year allowing Cornell students accepted by one of the 11 agencies to get paid for their work, as well as the reciprocal "win-win" aspects of a program that provides agencies with Ivy League interns, many of whom arrive armed with research experience in the social sciences. "Pretty much my entire career has been doing work on behalf of children and families," Blumenthal explains. "It was my hope that students would have some exposure to that." When asked to describe their experiences, Blumenthal interns almost always mention the high level of responsibility they were given on the very first day of their internship. "I put my hand in every project," recalls Abbie Dinowitz '12, whose position at Student Assistance Services in Westchester had her compiling research, coordinating a pharmacy educational campaign about prescription drug abuse among teens, conducting community surveys to determine appropriateness of advertising of alcoholic beverages to children and more. Karen '72 and Dave Blumenthal '71 have funded paid internships for Cornell students every summer since 2000. To date, there have been 108 Blumenthal interns, and the Blumenthals say they would "be thrilled" for that number to grow through donations from other alumni and friends of the university. With investment from others, Karen Blumenthal would add more agencies to the list that now includes the Child Care Council of Westchester, the Pace Women's Justice Center and Let's Get Ready, an organization that provides free SAT-prep and college admissions guidance to low-income students in New York City. She has direct experience working with most of the agencies on the list, a fact that may account for the level of responsibility given to Blumenthal interns. Nancy Law, an assistant director with Cornell Career Services, administers the program. "For students considering the non-profit sector," Law says, "direct experience with the reality -- rewards as well as challenges -- is critical to have before accepting a full-time job." And summer jobs and internships are de rigueur on a recent college graduate's résumé in today's tight job market. In addition to helping a graduate land a job, an internship can also help form his or her ideas about what sector to pursue, what kind of work he or she might be good at, and what kind of work might be most valuable or rewarding. Negrin's internship changed the course of her life. After graduation, she applied to work at the Children's Village as a full-time employee, but there was no open position. She volunteered herself as a caseworker, working 40-hour weeks for three months until a paid position opened up. She is now a professional caseworker for foster children at Children's Village and will enter an evening master's program in social work at New York University next month. "That summer really opened my eyes," she says.